But what some people don’t know is that copper is a “living” metal. Without regular care, copper undergoes a natural weathering process called oxidation. Much like the formation of rust on iron, a patina will develop on copper when oxygen and water interact with the metal. Patina develops with different colors and patterns depending upon a number of factors including geographic location, temperature, humidity, precipitation, air pollution, and even room ventilation. Patina can range from brown and blue to the green hues many people associate with weathered copper. When the Statue of Liberty arrived in New York Harbor on June 19, 1885, she was much shinier than she appears today. 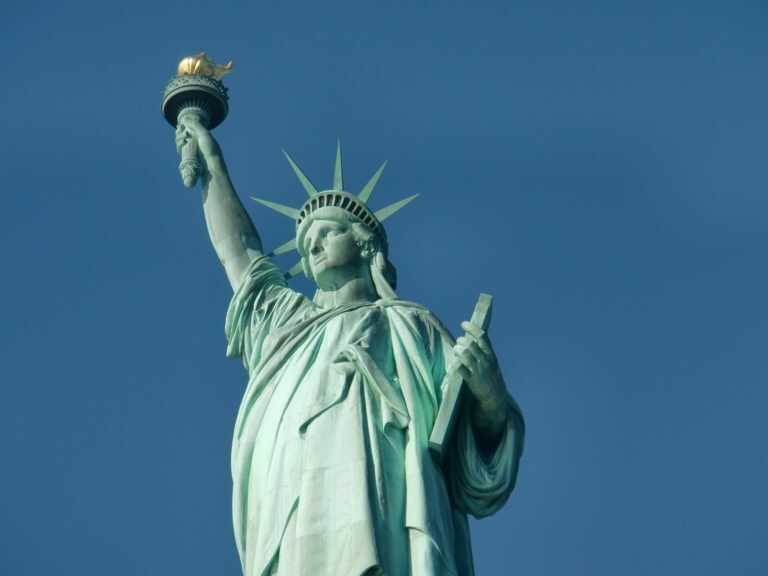 It took decades of wind and water to create the green patina Lady Liberty now wears. 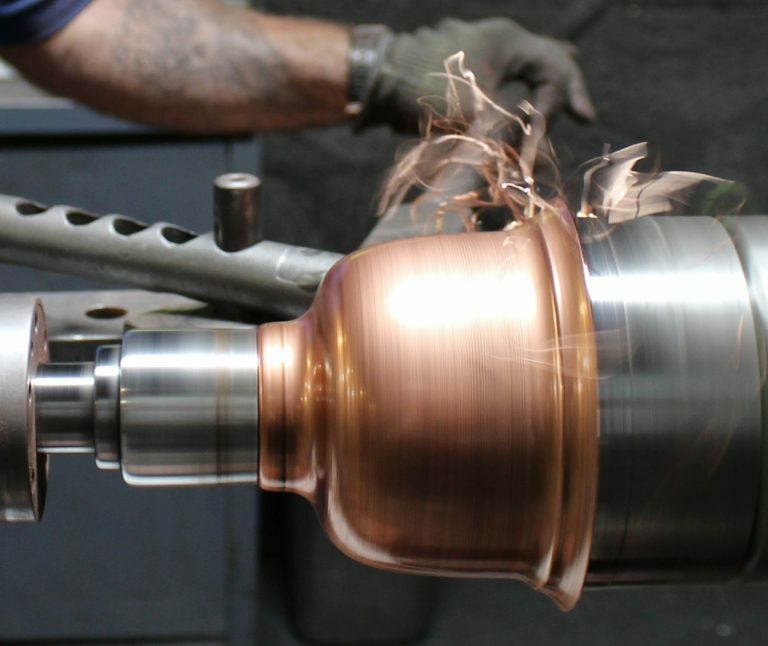 While some people prefer the shiny newness of copper, the patina that develops actually protects the metal. 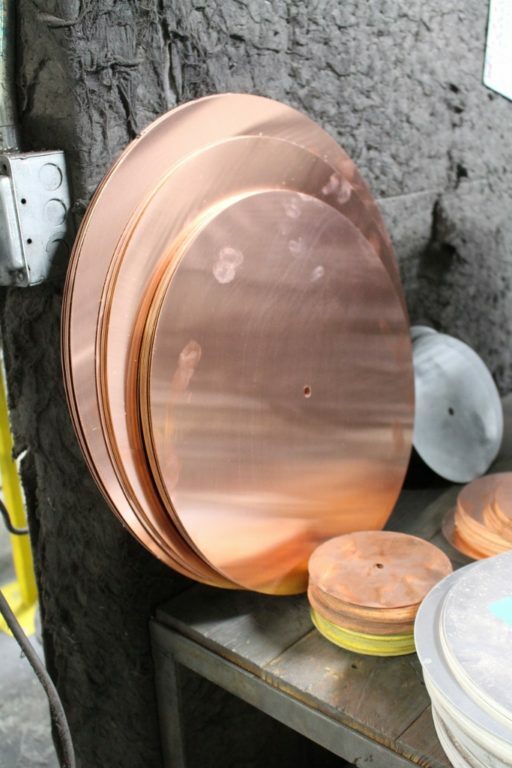 This patina is a truly unique finish because it arises from conditions particular to the copper’s location and environmental conditions. Mira is a Barn Light Electric customer in Seattle, Washington, who chose handcrafted copper Drake Gooseneck Lights to adorn the exterior of her 1920s-style Craftsman home. You can read more about her renovation project here. She installed these gooseneck lights in 2014 and took photos of her lighting and matching copper gutters shortly after. We recently asked Mira if she could share what her lighting looks like now after five years of exposure. 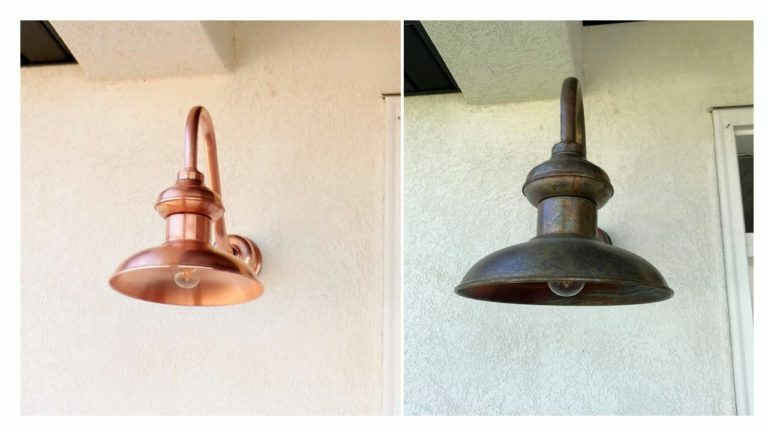 These before-and-after shots show that Mira’s lights and gutters have taken on a brownish hue. In Utah, Natalie’s Chestnut Gooseneck Lights also started developing a patina shortly after installation. Her before-and-after pics above show the rich color and pattern that the elements in her area produced on the metal. 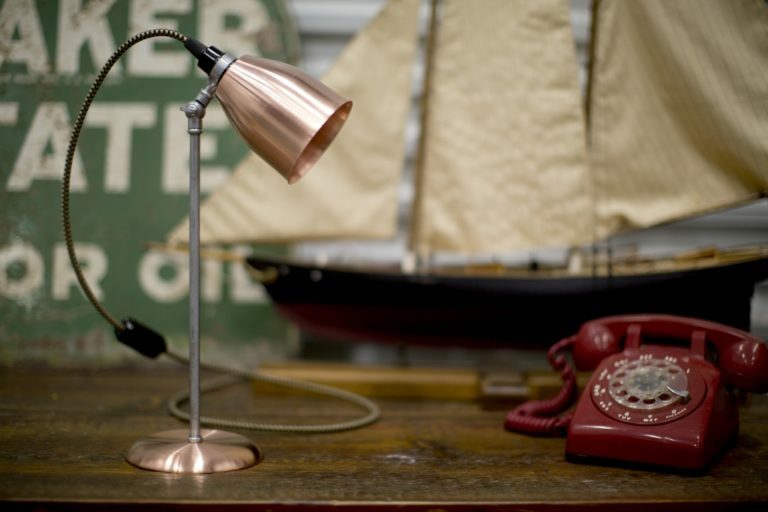 If you prefer the new-penny look of copper, you can keep your copper lights shiny with regular cleaning. When you purchase a copper light from Barn Light Electric, you receive a sample of Bar Keeper’s Friend, a gentle cleaning agent that works well on copper. No matter what finished look you love, every copper light we create is handspun from solid copper and crafted with attention to every detail. 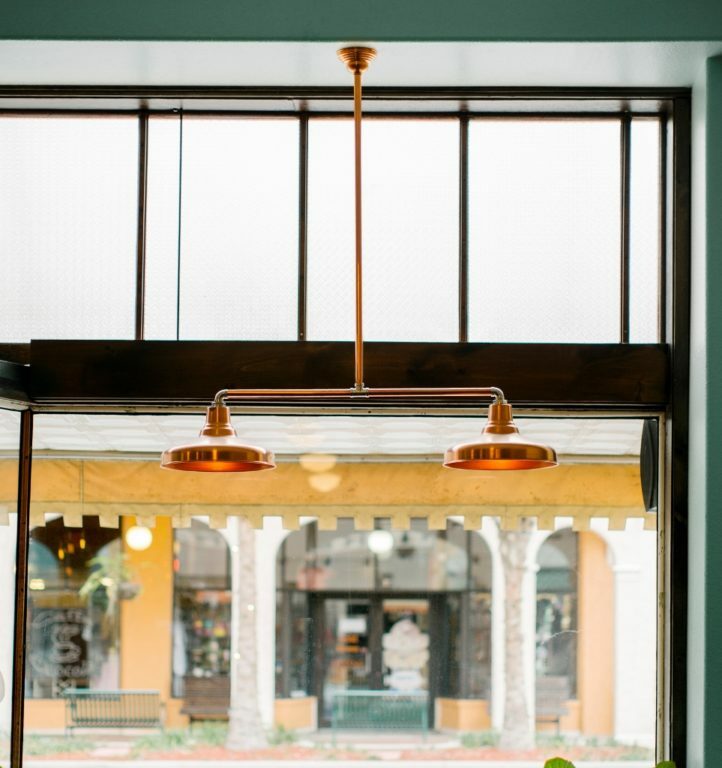 From pendants and wall sconces to statement pieces like a chandelier, copper lighting creates a look unrivaled by any other!